On Broadway, the Seafarer a play by Conor McPherson from the acclaimed National Theater of Great Britain is based on a Christmas Eve in a coastal settlement north of Dublin city where two brothers live. The play made its world premier in September 2006 at the Cottesloe auditorium of London’s National Theater. It received an Oliver award nomination for the Best Play. Sean Mahon making his debut in Broadway The Seafarer in the role of Nicky Jim Norton received the 2007 Oliver award for the Best Performance in the supporting role.The story begins on a Christmas Eve in a coastal town near Dublin where Richard (Jim Norton) an alcoholic has become blind due to a freak fall. The play’s star James ‘Sharky’ Harklin has recently returned to live with his brother and take care of him. Things are in no way better with Sharky for he is a man with a violent past and no job, a bad marriage and his own drinking habits. The two brothers are getting ready for the Christmas festivities and preparing for their guests, two drinking buddies of Richard. One, being Ivan who tries to spend most of the time hanging around out, away from his wife and Nicky who has now taken up with Sharky’s ex-wife. The four men have plans to play cards. The story undergoes a twist when a fifth man Mr. Lockhart, drops in as a surprise visitor with Nicky. Nicky had befriended him at a club. The story takes a twist when it is revealed that Lockhart arrives due to an intense motive and it so happens that on that Christmas Eve Sharky plays for his immortal soul. Conor McPherson considered as one of the better contemporary Irish play writers, attracts good reviews. His play ‘The Wier’ won the Lawrence Oliver award for the Best New Play in the year 1999.With his other classic in the year 2004 ‘Shining City’ , he has been described as one of the finest playwrights of the new generation. The plays have been produced in the Westend and Broadway. McPherson after his classic hits ‘The Wier’ and ‘Shining City’ now returns with a fresh supernatural play ‘The Seafarer’. In Broadway, the Seafarer which began its previews on the 30th October 2007 was originally scheduled to open on 15th November but due to a recent strike, opened its entries on the 6th December and is being played at the Booth Theater (222 West 45th Street, between Broadway and 8th Avenue New York NY10036). It will be played from Tuesday-Saturday at 8 pm, Wednesday and Saturday at 2pm and Sunday at 3pm. It’s a two hour play with one intermission. In Broadway, the Seafarer is all set to give you goose bumps! Get the best seats and the best rates by online booking through booking agencies now! 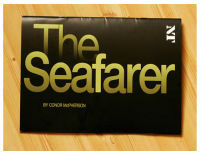 To view a great selection of Broadway The Seafarer Tickets online, click the link!